The ECO8020 is a highly versatile automatic sync and signal changeover unit with configurations and capabilities required to address modern master sync application and other advanced sync timing application. 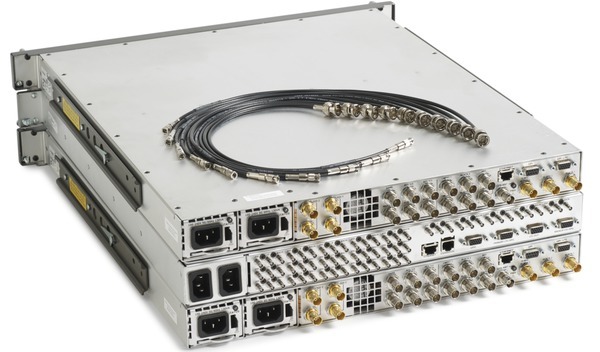 This changeover unit offers exceptional reliability, stability and high availability and is designed with optional high bandwidth input changeover capabilities for HD/SD and/or 3G-SDI signal environments. This changeover unit can be used with the following signal generators to form the complete sync generator system, which offers extra redundancy for the critical timing and synchronization system in the facilities. The ECO8020 provides up to 20 user-configurable channels with high density BNC connectors and four LTC channels through the breakout cable. Each channel consists of primary and backup inputs, and an output. 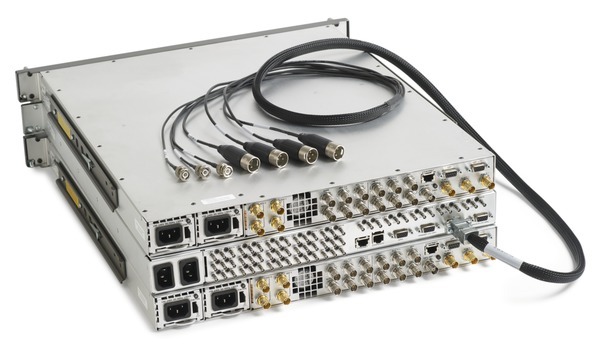 The base configuration has five 50 MHz Electronic Fast Switch channels with options for 15 more 50 MHz Electronic Fast Switch or 3 GHz Relay Switch channels in groups of five channels each, plus four optional LTC channels. The 50 MHz Electronic Fast Switch channels support black burst, HD tri-level sync, AES/DARS, and word clock signals. The 3 GHz Relay Switch channels support SD/HD/3G-SDI signals as well as most analog reference signals. For applications that require more than 20 high density BNC channels, two ECO8020 instruments can be configured to work as a single system which practically doubles the number of channels available (up to 40 high density BNC channels and eight LTC channels). Channel configuration can be set either via the front panel or the ECO8020 Web User Interface. Signal amplitude fault detection level follows the setting of the channel configuration. Detection on individual channel may be disabled, giving the option of disabling switching to the backup unit on failure of signals not critical to the facility operation. When operated in the switch-on-fault mode, the ECO8020 will automatically select the backup sync source should any of the primary inputs fail. However, in the unlikely event both sync sources are faulty, the ECO8020 will not alternate between the two sources. If necessary, this function may be overridden with the manual sync source selection. Manual source selection also facilitates periodic testing of the changeover function. The Electronic Fast Switch function, which comes standard with all 50 MHz Electronic Fast Switch channels, significantly improves the changeover switching speed and thus minimizes disturbance of the reference sync signals when switching between primary and backup inputs. The Electronic Fast Switch channels have latching relay backups that engage on loss of power to maintain the selected signal path. The optional 3 GHz Relay Switch channels are optimized for SD/HD/3G-SDI signals, but are also usable for most reference signals. These channels utilize high bandwidth latching relays to preserve the selected signal path upon a loss of power. In addition, these channels are equipped with the Tektronix patent-pending "Relay Check" function 1. When this function is enabled, the instrument automatically checks the signal level on each 3 GHz Relay Switch channel before and after every changeover switch to determine the condition of the relay contacts of these channels. If it is determined that the relay contacts may have nonconductive coating (such as oxide) buildup, the instrument will cycle the relay rapidly for 20 times to wear through the layer of nonconductive coating in an attempt to restore the relay connections (relay self-cleaning attempt). 1 The Relay Check function on the 3 GHz Relay Switch channels operates only on channels that are connected (terminated). The optional LTC channel connections are pin-compatible with the Tektronix SPG8000 and TG8000 1 generators, so these signals can be connected with standard 15 pin D-SUB cables. The same cable can be used to carry GPI connections, which allow the SPG8000 to trigger a changeover on certain error conditions such as loss of genlock. 1 The TG8000 generator must have a GPS7 module installed in order to support LTC generation. In association with the LCD display, front-panel controls are provided for source selection, operating mode, resetting the fault indicators, and for disabling the front-panel controls. LED fault indicators are also provided for each individual channels as well as the status of the power supplies. When the unit is connected to an Ethernet network, these functions are also available from the ECO8020 Web User Interface using a Web browser on a computer connected to the same network. The optional hot-swappable, redundant (backup) dual power supply system (Option DPW) virtually removes the risk of sync loss due to power supply unit failure, minimizing disruption in operations. Unique to the ECO8000 and ECO8020, the unit periodically tests the backup power supply to verify its performance. If the test fails, a fault will be indicated on the LED fault indicator as well as an error message for backup power supply replacement - providing extra assurance that the backup power supply will be ready when needed. Each power supply module has both AC and DC indicator LEDs. These LEDs continue to operate for 10 minutes after the loss of power. This allows quick troubleshooting in the event of supply or AC power failure. Alarm and status information can be reported through SNMP, GPI, email notification, and/or the ECO8020 Web User Interface. 1 You can add any combination of Option REF and HREF channel modules, but the total number of additional modules is limited to three. When both REF and HREF modules are ordered, the REF modules are always installed so that they have lower channel numbers than the HREF modules. 1 All power cords include a locking mechanism except as otherwise noted.